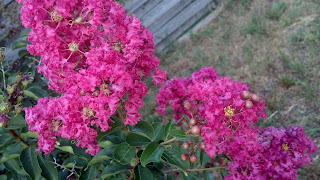 This is a crape myrtle in my back yard. It's a pretty bright color, isn't it? 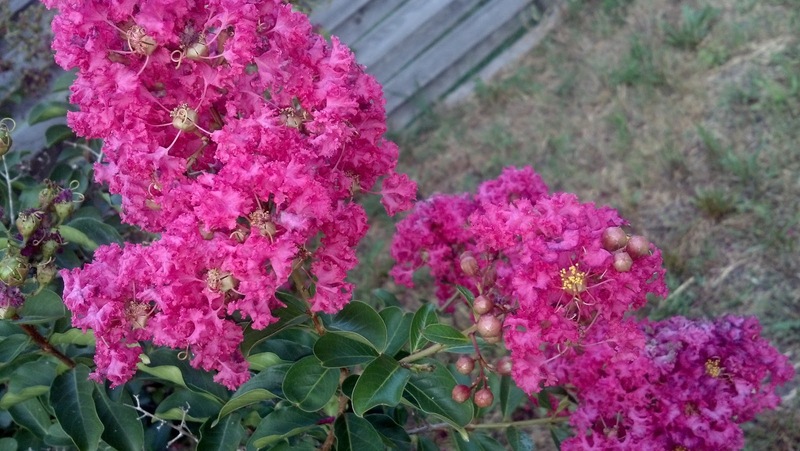 With a little rain, these particular trees tend to go crazy with blooms. This is one of the trees my dad gave us when we moved into the house, and it's been pretty hardy. The other trees in the yard have had various ailments, such as shiny evil insects, or a fungus or two, but this tree, and its twin, have been impervious. I find this interesting because these two trees are also planted the furthest away from the house, where the soil is least accommodating. They hardly ever get watered, because the hose takes forever to stretch out to their corner. Essentially, they only get a good soaking when it rains. Yet they have thrived. They tower over me, as green as they can be, with these bright blooms. What does that tell me? It tells me that even when all hope seems to be lost, when what gives us joy seems to have dried up, we must hang on. We must at least try. Survival--not just our physical survival, but our spiritual survival--requires that we at least try. Why? I don't know the answer to that, not every time. I do know that when I have been able to hang on for just a little longer, brighter days do come to me. The color is beautiful! Our hydrangeas are just about to bloom. I can't wait to see what color they will be this year (It's dependent on the coil composition).